Home > Education > Convocation ceremony of Great Lakes Institute of Management. 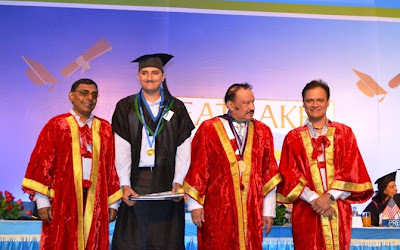 Convocation ceremony of Great Lakes Institute of Management. Great Lakes Institute of Management today held its ninth Convocation (2013) wherein students of PGPM (1 year flagship program), PGXPM (2 year Executive MBA) and PGWPM (2 year Weekend MBA program) graduated in the august presence of Renowned industrialists Mr. Vellayan, Executive Chairman, Murugappa Group and Mr. Ramesh Vangal, Founder and Chairman, Katra Group; and Dr. Bala V. Balachandaran, Founder & Dean, Great Lakes Institute of Management. This year marks the entry of Great Lakes Institute of Management into its tenth successful year since its inception in 2004. The event commenced with Dr. Bala V. Balachandran, Dean, Great Lakes Institute of Management, declaring open the ceremony at the Chennai Trade Centre. The auditorium was high on spirit and there was excitement in the air, marked with sense of enthusiasm and pride as the students waited to receive the graduation certificates. In an enlightening speech, Dr. Bala V. Balachandran expressed his happiness and wished the graduating students all success in their professional careers. Keeping up with the philosophy of Great Lakes, he added that the sole purpose of attaining the best education is to give back to the society and create opportunity for all. In his speech the Chief Guest Mr. Vellayan emphasized the importance of facing challenges in the real world with the right spirit. Delivering the Presidential speech Mr. Ramesh Vangal advised the students to follow ethical practices and create the right impact in society. Prof. Sriram, Executive Director, Great Lakes Institute of Management, reported that this year 429 students graduated of which 362 students were from PGPM Class 2013, 30 PGXPM students of class 2013 and 37 students were from PGWPM class 2012. Excitement and joy flowed as families and friends cheered for the graduating students who received the degree certificates from the chief guest. A special moment of pride and accomplishment grew among the graduating mothers, who went on to set new levels for their counterparts. · Karmayoga a philosophy driven concept of learning played an integral part of the study programme. Through Karmayoga students participated in several social projects in order to uplift the standards of the society which also foresaw nurturing of leadership qualities in students. 20 villages around Great Lakes have been adopted for the Karma Yoga program and the students visit these villages every week. Since its humble beginning in the year 2004, Great Lakes Institute of Management has established itself as a strong brand among other B-Schools in the country. It has a strong network of alumni with over 2215 individuals currently working in several countries apart from India. Being pioneers of entrepreneurship, Great Lakes have spread the culture among their alumni as well, with many alumni choosing to be entrepreneurs. Also, the year 2012 also makes a mark in Great Lakes Alumni history as we held the first overseas Alumni Meet at London on 6 Oct 2012. Bala V. Balachandran, Dean, Great Lakes Institute of Management: Be grateful for what you’ve achieved today, thank everybody and anybody who were involved in your success today. You may forget your school, your teachers and maybe your colleagues, but never forget your parents as they have sacrificed a lot in order to make you stand here. Vellayan, Executive Chairman, Murugappa Group: Don’t think out of the box as it is uncertain and has no guarantee, but think from a new box for further growth. One should possess adaptive capacity, listen signals from noise. We are smart people but don’t think you are the smartest, as in life you would get to meet lot of people from whom you’d get to learn a lot. When you cultivate such attitude you’d get to build new relationship and family. I urge you to put your mind in three things Think Big, Think Different and Think Together. Human being has no limitation; the only boundary is your skull. I see the crisis in our country as big opportunity and what our country need today is a leader and it’s you. Aspire to be one, aspiration is very powerful word. The institute offers a flagship one year Post Graduate Program in Management besides a Two year regular Post Graduate Diploma in Management. In addition, for Executives there are 2 part time programs to choose besides a Global Executive MBA in Energy Management in association with Bauer college, Houston Texas. Great Lakes Institute of Management is guided by a Business Advisory Council chaired by Mr. Ratan Tata, and comprises of corporate stalwarts like Mr. Jamshyd Godrej, Mr. S Ramadorai, Mr. Kumaramangalam Birla, Mr. Narayana Murthy to name a few. The Academic Advisory Council chaired by Dr. Bala V Balachandran includes world renowned management gurus including Dr. Philip Kotler, Dr. Seenu Srinivasan, Dr. Raghuram Rajan and Dr. Aswath Damodaran amongst others. Mr. Jamshyd N Godrej is the Chairman of the Board of Directors of Great Lakes Institute of Management. Faculty from leading business schools such as Harvard, Stanford, Stuart, Kellogg and Florida teach at the institute. Chinese is a mandatory course for the students at Great Lakes. Eminent personalities like Dr. Ratan Tata, Dr. Deepak Chopra, (Late) Dr. C.K. Prahalad, Dr. Y.V. Reddy, Dr. Philip Kotler, Dr. Finn E Kydland , Mr. Vivek Paul, and Mr. Rahul Bajaj have visited the institute and have addressed the students.